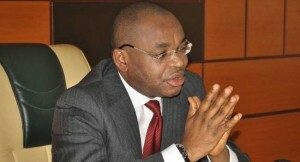 Akwa Ibom State Governor, Udom Emmanuel, has reiterated his commitment to delivering the dividends of democracy to the people of Ikot Ekpene senatorial district in spite of distractions. The governor said this while addressing thousands of people at Ikot Ekpene during his investiture as the Grand Patron of Ati Annang, the apex socio cultural organisation in Annang land. Speaking in company of his wife, Mrs Martha, who was also inducted as a member of the organisation, Governor Emmanuel thanked the group for the honour. He expressed appreciation to the people of Ikot Ekpene for their support during the 2015 governorship election and vowed not to disappoint them. Former Akwa Ibom State Governor and Minority Leader of the Senate, Godswill Akpabio, and the Speaker of the State House of Assembly, Honourable Onofiok Luke, said the honour was well deserved. The International President of Ati Annang, Mr Udo Kerian, explained that the honour was in recognition of Governor Emmanuel’s impressive performance in the state. The event, which was the Annual General Meeting of Ati Annang Foundation, was witnessed by thousands of Annang indigenes and friends from all parts of Nigeria. The high point of the occasion was the award of scholarship to indigenes of the senatorial district.